Rumney, by Ward Smith, 2017. 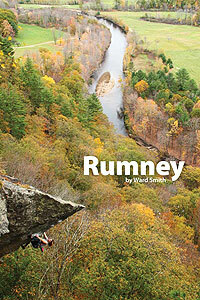 Eagerly awaited new edition of this superb guide to the popular crags on Rattlesnake Mountain in Rumney, NH, home to "the best sport climbing in New England." Hundreds of routes described on crags and boulders, from 5.0 to 5.15, with many topo drawings and color photos. 178 pp, 6" x 9".